I am sure that you would be worried before buying an Indian manufactured tablet which is priced very cheap. 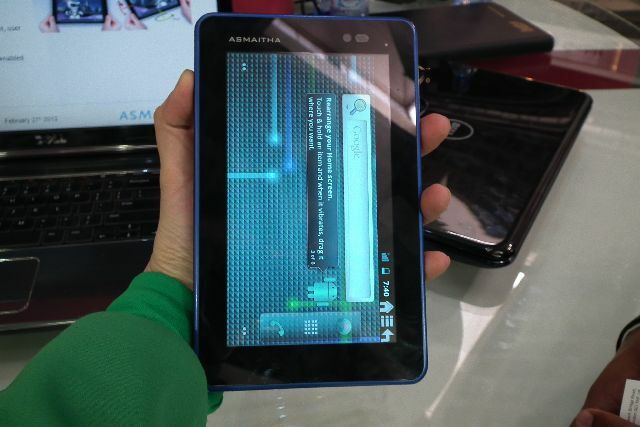 Thanks to Aakash that it has given a wrong impression of the cheap Indian manufactured Android tablets. Fighting hard for the verdict is the Asmaitha Sruta tablet which is announced today. It was slated to be announced at Mobile World Congress this year but they eventually couldn’t make it with time limits. Asmaitha an Indian electronics company has chosen Sanskrit name to this tablet. ‘Sruta’ in Sanskrit means ‘that which is heard’ in English. Eventually we might now be sure that this would be the code name of the project and final name might be something different. So lets go through what Sruta tablet has in offering of its specifications. 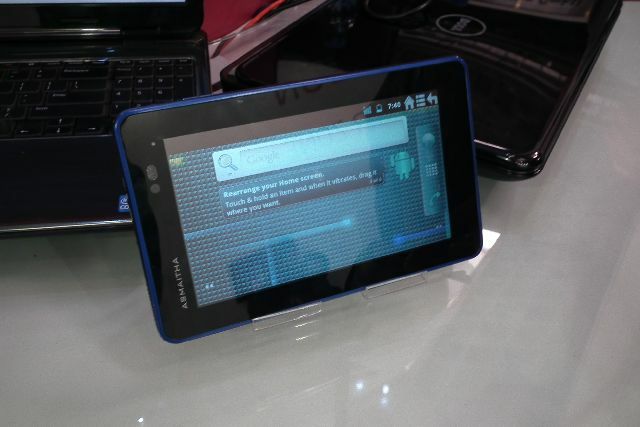 The Sruta is a 7 inches Android tablet which runs on the dual core ST Ericsson Nova A9500 based Cortex A9 processor clocked at 1 Ghz. It has additional 1 GB of RAM and comes with 8 GB internal storage capacity. If you think that the 8 GB internal storage capacity is not enough for you then you can make use of the micro SD card provided with this tablet at one end and pump in extra memory by adding a micro SD card, you know that you can add up to 32 GB with micro SD card thereby increase the size of your internal storage. The 7 inches display provide a maximum resolution of 800 x 480 pixels and company spokesmen also mentions that 10.1 inches variant is in pipeline which will provide a maximum resolution of 1280 x 800 pixel resolution. That is not just the end of specifications of the Sruta tablet as it has got 8 mega pixel camera on the rear side to take photos and videos at 720p HD and two mega pixel front facing camera for video chat and video calls sets back the features of it as found in the best tablets now. Other functions included in this tablet are Bluetooth, Wi Fi internet access and 3G, HSPA+ capability for internet access. The product will be powered with 6000 mAh battery which provides a life of atleast 10 hours on the continuous usage. You can also find a micro HDMI port along with a USB 3.0 port. 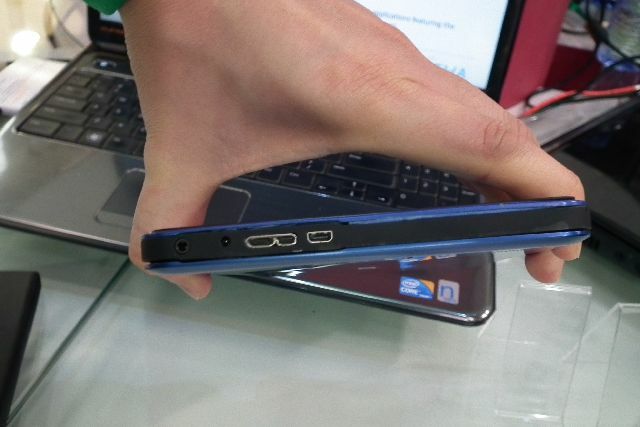 This tablet sets the benchmark of being the first Android tablet in the world to come out with USB 3.0 port. The tablet comes with various sensors like G-Sensor (Accelerometer),E-Compass Sensor, Ambient Light Sensor,Proximity Sensor,Gyroscope, GPS. The tablet has the dimensions of Width: 180mm , Height: 120mm, Thickness: 10.9mm and comes with 3.5 mm stereo headset jack. The Bangalore based tablet maker has confirmed that this tablet at present will be powered with Android 2.3 Gingerbread operating system and it will be upgraded to Ice Cream Sandwich, i.e., Android 4.0 by the end of the year. It’s clear that this tablet is quite better than the Aakash tablet which flopped eventually. We are eagerly waiting for the hands-on of this tablet. This tablet will be made available to the users by the end of this year for a price of $ 200 or £ 160, the price at which you can buy Amazon Kindle Fire. No other details were released by the company spokesmen. I would say if its priced at Rs 10,000 or at $ 200 then it would be the ideal price for the tablet and if the price goes beyond $ 200 then Kindle Fire would be a straightaway pick by the users. Also, as Amazon has arrived in India in January, it’s clear that they start selling Kindle Fire at a reasonable price. Do check out other tablets which are just announced and its tipped to be released within three months. Among them are the Gigabyte S700 with no pricing information and low on specifications and other one is Viota M970 priced at $ 120 in retail.